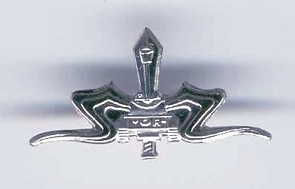 IDF Israel Army Palsar 7 Pin. The Israel Army Armoured Corp is one of many units carrying a selction of pins, insignias and tags associated with Israel's fight for survival in the middle east. As long as we need to live by the sword, a nation of warrior poets will continue to strenthen themselves in order to ensure the presevation of our unique heritage. Purchase this item as a souvenir reminding us of the indomitable spirit of the Jewish people, who, within the span of one generation, rose from the ashes of destruction to fight proudly for the land of their ancestors. The formidable might of the Israeli armed forces is expressed in the many tags and insignias available for sale on Dokomedia's page here at Amazon, along with many other items of interest to those interested in these collectibles. As much as Israel's military might has been necessary in the past and even in the present to protect the Jewish people living in their ancient homeland, the reality of today's world shows us that ultimately it is the human soul which carries the real answer to peace. With this thought in mind, one does well to remember the tremendous sanctity of life in Jewish tradition, and one can pray that these values will always accompany the pilots of the Israeli air force, such that the Jewish people will indeed merit divine protection in times of trouble.